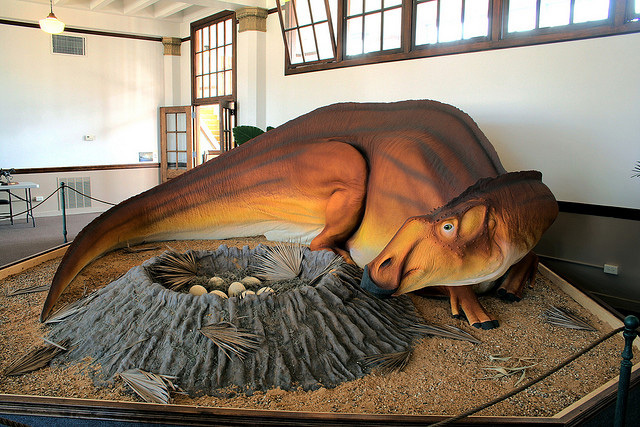 A model of Hypsibema missouriense on display at the Bollinger County Museum of Natural History in Missouri (model by Guy Darrough/Lost World Studios); photo by Serrator on Flickr (use permitted with attribution). A duck-billed dinosaur (Hadrosaur) that lived in Missouri about 75 million years ago during the Late Cretaceous period, the Hypsibema missouriense fossil was discovered in 1942 near the town of Glen Allen, Missouri. Dan Stewart was researching clays for the Missouri Geological Survey when he took time to explain to eight-year-old Ole Chronister that he was looking for clays "as old as dinosaurs." Ole showed Stewart some bones his family had found digging a well. Dan Stewart realized they were dinosaur bones and helped get them to the Smithsonian Museum. The bones were the first known find of dinosaur bones in Missouri. The dinosaur was first thought to be one of the sauropods and named Parrosaurus missouriensis. But when teeth from the dinosaur were found at the same site in 1970's they showed that it was a hadrosaur, or "duck-billed dinosaur." Hypsibema missouriense* was a vegetarian,chewing with over 1,000 teeth! 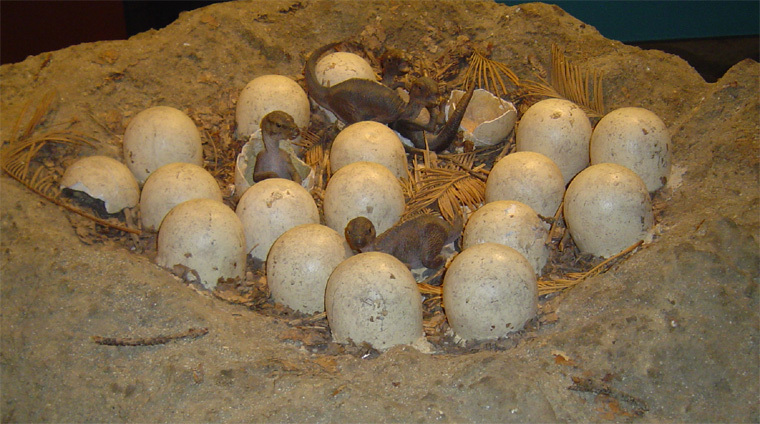 Reconstruction of duck-billed dinosaur nest at the Natural History Museum in London (public domain image on Wikipedia).